There are almost 100 species in the genus Spirarea, all of which are native to the northern hemisphere. Several have been popular garden shrubs for generations, and many named varieties are equally popular today. These deciduous shrubs are beautiful and easy to grow. If you are purchasing spirea shrubs for your garden, check the full name of the shrub carefully. Many nurseries use the common name 'spirea' for varieties of Caryopteris, which is a completely different shrub. Don't get the wrong one by mistake! Spirea are easy-care shrubs that flower best when grown in full sun. They can be planted in the spring or fall. The new plants should be kept moist while they are getting established, but older shrubs can tolerate dry soil and some drought. In fact, some species of spirea are recommended for water-conserving landscaping. The large, arching species usually bloom in the spring, while the smaller, upright species generally bloom in the summer. Spring-flowering spirea should be pruned right after they bloom, before new buds start to form for the following year's flowers. Summer-flowering spirea should be pruned in late winter or early spring. Cut old canes back at ground level. Bushes can be rejuvenated by removing one-third of the plant, keeping the youngest and most vigorous canes and removing the oldest. Spirea are easily propagated from cuttings of green tip shoots taken in late spring and summer. They root best if given bottom heat. Mature wood cuttings can be taken in autumn and rooted in a cold frame. Several different kinds of spirea are grown as garden shrubs. This is the shrub that comes to most people's minds when they think of spirea. Your grandparents probably grew bridal veil spirea in their gardens, and you may want to grow it too. Spiraea x vanhouttei is commonly called 'bridal veil spirea', but Spiraea prunifolia is also known by that name. These are large bushes, growing up to ten feet tall and sometimes as much as twenty feet wide. Their arching branches are laden with tiny white flowers in the spring. Seeing a hedge of bridal veil spirea will take your breath away!Spiraea cantoniensis, commonly called Reeves Spirea, is a double-flowered white bridal veil. It is a smaller shrub, and in warm climates it may keep its leaves through the winter. Spiraea thunbergii is also called thunberg spirea or garland spirea. This is a graceful shrub with slender, arching branches that grows three to five feet tall with a similar spread. The shrub has an almost feathery appearance, making it valuable as a foliage plant. The small leaves turn orange in the fall. 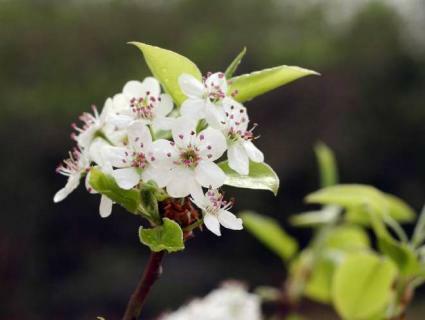 It blooms profusely in late winter or early spring, before the new leaves appear. This species is native to China and Japan. It blooms best in full sun, and bloom is heaviest in cool climates, where the small white flowers can cover the entire shrub. In warm climates, the bloom is less intense but lasts for a longer time. Baby's breath spirea can be propagated by dividing the root clump, unlike some other species. Several cultivars from Spiraea japonica are grown as garden plants. These are upright shrubs growing two to six feet tall. They bloom in summer. The flowers are white, pink, or red; the 'Shirobana' variety has all three colors at once. Some varieties have yellow or purple foliage. Spiraea x bumalda is a cross between S. albiflora and S. japonica. These are low-growing shrubs, two to three feet tall with a slightly wider spread. Some varieties have yellow foliage. Burmalda spirea bloom in the summer. The flowers are pink or white depending on the variety. S. x bumalda 'Anthony Waterer' is the best known variety. Spiraea Astilboides - A moisture-loving plant of unusual merit, happiest on the banks of a stream or pond. It is quite distinct, the inflorescence much branched, and the flowers of a creamy white closely packed on the stems. 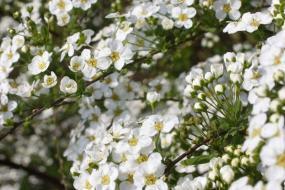 Spiraea Camtschatica - A gigantic Meadow Sweet, growing from 6 to 10 feet high, with huge palmate leaves and large fleecy bunches of white flowers crowning the tall stems. Its place is in rich bottoms or by water in deep soil. Dropwort (Spiraea Filipendula) - A British species, 1 to 2 feet high, with loose clusters of yellowish-white flowers, often tipped with red. When the flower-stems are pinched off it forms an effective edging plant, its Fern-like foliage being distinct. The double variety (S. Filipendula fl.-pl.) is useful in the mixed border. Division. Queen of the Prairie (Spiraea Lobata) - One of the best of the hardy Spiraeas, 18 to 36 inches high, with deep rosy carmine flowers in large terminal cymes. It thrives in sandy loam on the mixed border, on the margins of shrubberies, or grouped with the finer perennials. Spiraea Palmata - A beautiful herbaceous plant from Japan. It has handsome palmate foliage, and in late summer broad clusters of rosy-crimson blossoms. When well-grown it is a fine plant for large rock gardens, in borders, or on the margin of shrubberies, and being strong enough to take care of itself, it may be naturalised. Spiraea Ulmaria - This native Meadow Sweet deserves a place, if only for the sake of variety, in the mixed border, on the margins of shrubberies. Spiraea Blumei - A rare and pretty shrub of about 4 feet, gracefully arching, with blunt deeply-notched leaves and abundant white flowers in June. Japan. Spiraea Bullata - A neat shrub for the rock garden, only 12 to 18 inches high, with erect and downy branches, rounded and wrinkled leaves, and deep pink flowers in July and August. Japan. Syn., S. crispifolia. Spiraea Cana - A dense shrub of 1 to 2 feet, with grey down-covered leaves which give the plant a hoary appearance. The tiny white flowers are borne upon arching sprays throughout the summer, and quite freely even on small plants. Spiraea Canescens - A graceful shrub form the Himalayas, reaching a height of many feet at maturity, with hairy stems, small bluntly-oval leaves, and white (or rarely pale pink) Hawthorn-scented flowers in crowded clusters upon the slender sprays. The plant needs room to spread its whip-like stems, and is best in a sheltered place. Canton Spiraea (Spiraea Cantoniensis) - A slender bush, about a yard high, bearing many small clusters of white flowers. There is also a beautiful double variety in which the flowers last longer. The Plum-leaved Spiraea (S. prunifolia) is represented in gardens by the double variety (fl.-pl. ), a charming shrub, with flowers like tiny snow-white rosettes, in early summer wreathing every twig. S. media (better known as S. confusa) resembles S. cantoniensis, but its variety rotundiflora is distinct and pretty. Spiraea Decumbens - A mountain shrub from the Tyrol, seldom exceeding 6 inches in height, and excellent in the rock garden, where it spreads by means of underground stems. The clusters of white flowers, about 2 inches across, come freely in June against a setting of pretty toothed leaves. Spray Bush (Spiraea Discolor) - A lovely shrub 8 to 10 feet high. We should seek to give full expression to its singular beauty by careful grouping, taking care to save it from the horrible jumble that nurserymen give us when they plant a "shrubbery." Given an open position, it forms a large bush of good form laden during summer with spray-like panicles of small whitish flowers. Syn., S. ariaefolia. Spiraea Douglasi and S. Nobleana - Are so similar in growth and flower that they may be conveniently coupled, though as they bear their clusters of deep red flowers at different times it is well to have both. N. America. S. Douglasi succeeds in every part of the British Isles; S. Nobleana, from California, is less hardy, and flowers earlier. An allied plant of garden origin is S. Billardii, raised from S. Douglasi crossed with salicifolia. It is a pretty shrub of 6 feet, with oblong leaves, and narrow crowded spikes of bright pink flowers, 5 to 8 inches long, from July into September. S. pachystachys, another garden hybrid (from corymbosa and Douglasi) bears broader leaves and pale pink flowers. Spiraea Hypericifolia - From Asia Minor, the type of a small group, all good in growth and flower. The tall slender stems arch gracefully, and under good conditions reach a height of 8 feet, wreathed in the flowering season with clusters of small white flowers. Rosy Bush M. (Spiraea Japonica) - Easily recognised by its slender stems 3 or 4 feet high, surmounted by broad flat clusters of deep pink flowers. It is a variable species with several other names, such as S. callosa and S. Fortunei. There are also many distinct forms in cultivation, and of these the best are alba, a pretty compact shrub with white flowers; Bumalda, of the same dwarf habit but with deep rosy flowers; Bumalda Anthony Waterer, a good plant richer in color and approaching the fine form rubra from Japan, in which the flowers are intense crimson-purple and a shade larger. The plants called atropurpurea and coccinea by some hardly differ from this. Other varieties are splendens, with flowers of a pale peach color; glabrata, of more rigid habit, with bright pink flowers; and Froebeli, an early-flowering form with wine-red flowers passing to deep crimson. S. Bumalda ruberrima is a cross between Bumalda and bullata, dwarfer than its near parent, with larger flowers of deeper color; S. Margaritae is a cross between S. japonica and its variety superba, and is a hand-some plant with graceful wand-like shoots and large bright pink flowers. S. Foxii, another hybrid of dwarf habit, is less good. S. bella, from the Himalayas, comes near S. japonica, but is dwarfer and denser. All these kinds flower freely through the summer, and often till late in autumn. Plume Spiraea (Spiraea Lindleyana) - A noble shrub, sometimes 10 feet high, its graceful foliage divided, and delicate green, the flower clusters large, white, and plume-like, being at their best in August. It thrives in warm deep soil, and loves the chalk. In cool soils it does not do so well, seeming to spread more at the root, but is always beautiful in foliage and habit. Himalayas. S. Aitchisoni from Afghanistan also comes very near this, differing little save in its larger flowers, ruddy bark, and darker green leaves cut into smaller leaflets. Spiraea Salicifolia - A plant covering an immense area in Europe, Asia, and N. America, and even naturalised in parts of Britain. It reaches a height of 3 to 5 feet, with long serrate leaves and rosy flowers in July and August, their precise character differing in the many forms in cultivation. The best of these are grandiflora, a shrub of dwarf habit with large pale pink flowers; lanceolata (or alba) with white flowers; and latifolia with larger white or rose-tinted flowers. Spiraea Tomentosa - A little shrub of about 4 feet, with down-covered branches, oblong leaves grey or woolly with down on the underside, and white, pink, or purplish flowers in dense spikes. N. America. A pretty plant, one of the best in its autumn flowers, and with roots not much inclined to roam. Especially good in damp ground and overhanging water. Spiraea Van Houttei - A garden cross between media (confusa) and trilobata. In late spring it bears masses of white flowers so thickly clustered as to hide all else and emphasise the graceful droop of the stems. Indeed, these sometimes droop too much, allowing the clusters to drag and spoil in bad weather. The flowers open about the middle of May, and the wand-like shoots are useful for cutting. Being sensitive to cold winds and late frost, a sheltered place is best for this kind. Goats-beard (Spiraea Aruncus) - A vigorous perennial, 3 to 5 feet high, beautiful in foliage and habit as well as in flower. Its flowers are freely produced in summer in large gracefully-drooping plumes. It is valuable for grouping with other fine-foliaged herbaceous plants. It thrives in ordinary soil, but succeeds best in a deep moist loam. Europe, Asia, and America. Division. Thunbergs M. (Spiraea Thunbergi) - A dense bush, with small bright green leaves, and in early spring a profusion of tiny white blossoms. It is hardy, and especially suitable for planting in a bold rock garden or on a raised bank among tree-stems. Few shrubs are so fine in autumn, its small leaves changing to brilliant crimson.